I'm taking things back to the beginning of July, all in a bid to catch things up to the current day. I did consider doing a general catch up post but the truth is I have so much that I want to share with you all it would mean either one very, very long post or it would mean cutting everything short so I figured I would stick with doing separate posts for everything. I've wanted to get involved with a yarn-bombing project for some time now and was almost there arranging one for the Voluntary Arts Week but it just never worked out. James suggested I should contact the council and enquire about the Fling Festival which is an annual festival in our town (now a city I just can't get used to calling it that). I'll be honest I thought I'd be wasting my time and contacted them just to humour James. Well he got the final laugh because they agreed to have me there and so work began knitting up some bits ready for the event. they wanted me to run a workshop so people would come and sit with me throughout the day, knitting things that we could bomb the park with. All in all it wasn't as much of a success as I'd hoped. It was overlooked by everyone who attended. Our location wasn't amazing. We were sharing a tent with performers and were either ignored by people watching or were assumed to be part of the act. But you know what it was a learning curve, it didn't work out but that's OK. Everything happens for a reason and we did manage to do some yarn-bombing while we were there. 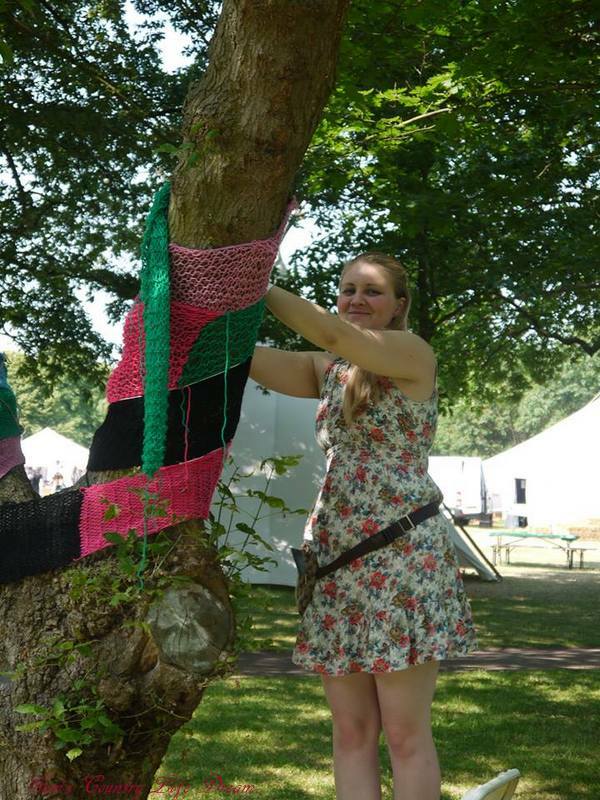 Thankfully my Mum had been knitting loads in the run up to the event so it wasn't a completely wasted day. I'm also not going to let this put me off. This is just the beginning of my yarn bombing adventures. Sorry to hear it wasn't as good as you had hoped it to be! Like you said it was an experience to learn from. Fingers crossed next time will be better. It's good to see you blogging again!How are you?